Maximilian Carlo "Max" Martini (born December 11, 1969) is an American film, theater and television actor known for his roles as Corporal Fred Henderson in Saving Private Ryan, Wiley in Level 9, First Sergeant Sid Wojo in The Great Raid, and as Master Sergeant Mack Gerhardt on the military television drama, The Unit. He also starred in the film The Town and 13 Hours: The Secret Soldiers of Benghazi. Martini was born in either Woodstock, New York or Kingston, New York, was raised in the United States, Canada and Italy, and reportedly holds citizenship in all three countries. His father, Raffaelle Martini Pandozy, a sculptor and reformist artist, was born in Rome. Martini's mother, Patricia (née Dunne) Martini Margolin, was a private investigator and parole officer. He has two siblings: actor/producer Christopher Martini and costume designer Michelle Martini. His stepfather, Stuart Margolin, is a director and actor. Max moved to New York City and studied acting, first at the Neighborhood Playhouse before continuing training at Michael Howard Studios. He then attended the School of Visual Arts in Manhattan and received a B.F.A. in painting and sculpture. After college, Martini found steady work in film and television projects. His film roles include co-starring opposite Jodie Foster in Robert Zemeckis' Contact as Willie, a fellow scientist with an affinity for brightly colored shirts, and sharing the screen with Tom Hanks and Matt Damon in Saving Private Ryan as Corporal Henderson, ranking NCO of Pfc. James Ryan’s unit, who helped Cpt. John H. Miller and his men in the brutal final shootout of the film. Martini later co-starred in John Dahl's The Great Raid as 1st Sgt. Sid Wojo. He appeared in smaller independent films, working with Calista Flockhart in Jane Doe, Chris Penn and Jeffrey Wright in Cement and in the 2000 Sundance Film Festival fave, Backroads. In 1999, Martini wrote, co-directed and starred in Desert Son. His younger brother, Christopher, co-directed the film with him and his sister, Michelle, served as costume designer. In 2011, the Noor Iranian Film Festival in Los Angeles invited him to participate as an official festival judge. In 2013, he played the role of the U.S. Navy SEAL commander in Paul Greengrass' Academy Award nominated film Captain Phillips. In 2013, Guillermo del Toro's cast Martini and Rob Kazinsky as the Australian father-son pilot duo in Pacific Rim  In 2014, Martini was cast in Legendary Pictures‘ supernatural thriller Spectral  In 2014, Martini is cast as Christian Grey's Bodyguard in the film Fifty Shades of Grey. In 2016, Martini portrayed Mark "Oz" Geist in Michael Bay’s 13 Hours: The Secret Soldiers of Benghazi. Martini’s television credits include a lead role in the Sci-fi Channel’s Emmy nominated mini-series Taken and appearances as Agent Steve Goodrich on the second season of 24. He was also cast in X-Files creator Chris Carter's Harsh Realm and had a recurring role on the Canadian series Da Vinci's Inquest. He also appeared on Lie to Me. After memorable guest-star turns on popular series, including Numb3rs, Walker Texas Ranger, CSI: Crime Scene Investigation and CSI: Miami, Martini landed a lead role on The Unit, a series about a team of tier-1 US Army special operators in the field and at home, which was created by David Mamet and produced by Shawn Ryan of The Shield. Martini remains active in the theater, having co-founded the Theatre North Collaborative in New York City, a company of American and Canadian actors dedicated solely to producing new works from both sides of the border. In 2011, he appeared in an episode of Criminal Minds, in which he played a Navy SEAL called Luke Dolan. In 2015, Martini stars as the title character in Amazon Studios' Western series Edge, written and directed by Shane Black. ↑ "Max Martini", Celebrity Networth. ↑ "Family `Unit' time in the Valley". Los Angeles Times. 2007-02-15. Retrieved 2013-11-09. ↑ "Stuart Margolin Comes Home, Again". The Dallas Morning News. 1987-10-18. Retrieved 2013-11-09. ↑ "Marion Dunne [obituary]". The Dallas Morning News. 2011-04-16. Retrieved 2013-11-09. 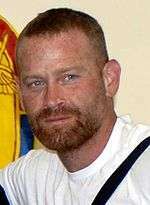 ↑ "Max Martini profile at". Filmreference.com. Retrieved 2013-11-09. ↑ Justin Chang (2013-07-08). "Film Review: 'Pacific Rim'". Variety. ↑ "Max Martini Joins Legendary's 'Spectral' Thriller". Deadline Hollywood. 2014-06-06. ↑ "Max Martini Cast as Bodyguard in Fifty Shades of Grey". E! Online news. ↑ T. Cole Rachel (2015-11-20). "Actor Max Martini Thinks We Need More 'Authentic Men' in His Business". Maxim. Retrieved 2016-09-02. ↑ Elizabeth Wagmeister (2015-07-30). "Max Martini, Ryan Kwanten to Co-Star in Amazon's Western Pilot 'Edge' (EXCLUSIVE)". Variety. Wikimedia Commons has media related to Max Martini.